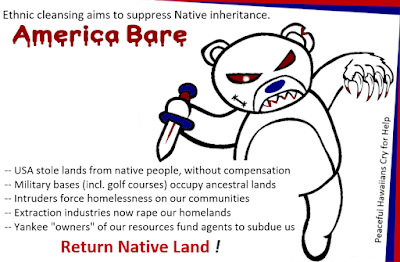 Occupied Hawai'i is one of many places aggressive intruders have stolen the inheritance of native communities. We Hawaiians remain peaceful as violence has been unleashed around us for many decades. We keep ALOHA alive around us. But let's face truth: unconcerned tourists and uncontrolled waves of nonresident investors fail to notice our suffering. They overlook Hawaiian children becoming homeless street kids, as the lands many generations have farmed & protected are stolen. The USA ignores its treaties and international laws on indigenous people. A continent of Native Americans are still besmirched & vilified as savages and "redskins" ... Outsiders occupy native lands, systematically humiliating American Indian, Aleut and Hawaiian communities. Pre-existing cultures are deliberately oppressed. 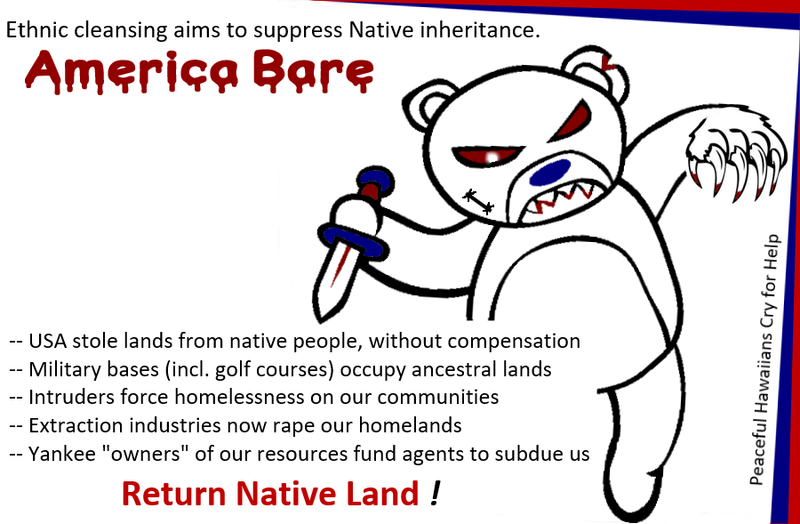 America Bare -- Ugly, violent, and they claim our inheritance.